What is it? Travel back to the earliest days of the peoples of the Emerald Isles, to a time when Irish myths were lived and strange magic spilled from the shoreline into an awakening land. Imagine the power and influence you could wield should you have dominion over all the tribes? Such a conquest must be built on wisdom and ingenuity, not just the brute force of a shillelagh. 2016 was an odd boardgaming year. I know I played plenty of games and enjoyed a great deal of those, and yet when it comes to recalling particularly memorable ones, my mind is a placid lake. So when I had the opportunity to spend a few weeks with Inis, a name which cropped up with alarming regularity over the latter half of the year, to say I was eager to lift the lid would be an understatement. I think it’s important to understand why Inis generated a fair amount of buzz because if you’re reading this review, you’ll likely already have an impression about what Inis supposedly is. Firstly, it’s a Matagot game which places it alongside games such as Cyclades and Kemet. For reasons that aren’t entirely clear to me, Inis also picked up a comparison to Blood Rage that still lingers. What with Blood Rage being one of the most popular games of 2015, it’s not hard to see why this Celtic take on ‘dudes on a map’ was being vaunted as the next big thing. Couple that with some glowing early praise, and you’ve got a powder keg of expectation. And lifting the lid does not disappoint. Regardless of how you feel about the box cover art (personally, I quite like it but I can understand the division), the contents of that box are simply glorious. Dimitri Bielak and Jim Fitzpatrick’s art is evocative and beautifully thematic, and the jagged continent-like map tiles are thick and just a pleasure to fit together. The clan models are relatively detailed and the variety of models, despite the fact that this has no gameplay impact, is appreciated. Don’t expect Blood Rage levels of quality and the models we played with had already contracted droopy spear syndrome, but as a whole Inis’ components are fantastic. I’ve mentioned Blood Rage twice and we’re not even 300 words in, so let’s just deal with that particular comparison now and be done with it. The answer is no, Inis is nothing like Blood Rage. If anything, many of the elements that turned people off of Blood Rage might actually draw them in, like a sunrise clearing a dense fog from the moors. There’s no runaway leader problem here, and even though combat in Inis is punishing it doesn’t swagger with the same brutality. And perhaps most importantly, almost every player at the table has a sniff of victory until the very end. Even those who find themselves dropping out of contention could well become kingmaker. The hook for Inis is simple enough – as the leader of a group of clans you seek to not only settle this emerald isle but to be its King. However, you’re not the only clan leader aspiring to greatness, but securing the throne cannot be achieved through bloodshed alone. Rather, any pretenders are required to fulfill as many of three different victory conditions as they can. One rewards exploration and the desire to see as much of this wild new world as possible – be present in at least six territories. The second comes as a result of shrewd negotiations and tactical acumen – become chieftain over territories containing six or more opponents’ clans. And lastly, what is a High King if he has not the favour of his gods – be present in territories containing collectively six Shrines. If at the beginning of the Assembly (the first phase of a round) a player has a Pretender token (more on that in a bit) and currently fulfills one or more of those victory conditions, that player wins the game. If more than one player qualifies, then the player who has fulfilled the most victory conditions is the winner. In the case of a tie, the player who is currently the Brenn is the winner – the Brenn is essentially the player who is chieftain over the Capital, a territory which is randomly selected at the start of the game. What constitutes being chieftain? Quite simply, if you have more clans in a territory than anyone else, you are the chieftain of that region. You will grow to love this card. And hate it. In equal measure. How exactly do you achieve any of this? 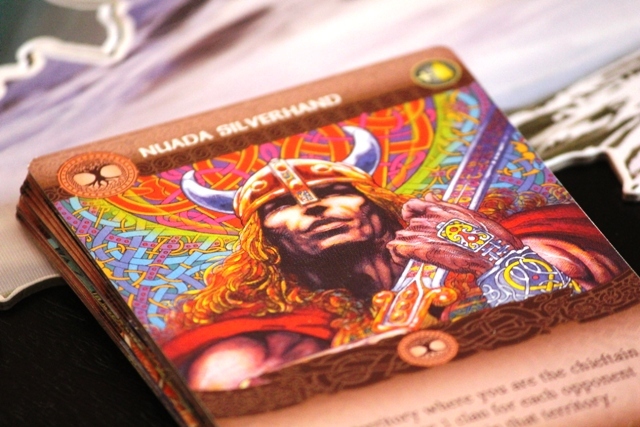 The lifeblood of Inis is in the Action cards. You can’t just choose a repeatable action such as moving or attacking, instead all possibilities are clutched between finger and thumb. Don’t have a card which lets you move? You can’t move. No combat cards? No hope of initiating combat. No clans on the board? If you don’t have a card which lets you deploy clans, you’re in serious trouble. There are 17 of these cards (less at 2 or 3 players) which are distributed each round by means of a draft. This draft does cycle in different directions, but that’s not what makes it smart. If you’ve ever played a game with a draft mechanic, you’ll no doubt be very familiar with the following scenario: you get that first hand of cards, your eyes light up with the possibilities and you select one, confident in its intrinsic awesomeness. However, as the draft proceeds you realise that card’s effectiveness is diluted with each passing minute and when the dust clears you’re left with a card that doesn’t synergise with anything else in your hand and is about as useful as a zen garden at a Trump rally. Inis cleverly sidesteps this by allowing you to pass on any card regardless of whether you selected it in a previous draft step. Draw 4 cards, keep 1 pass 3, keep 2 pass 2, keep 3 pass 1 – a sequence which is a boon for changing your strategy mid-draft. It’s also a critical bit of design, as much of Inis is about recognising what cards your opponent needs and potentially denying them. Once the draft is finished, players cycle through choosing one of three actions until all players have passed. You can play a card from your hand, you can take a Pretender token or you can pass. Pretender tokens can be claimed if you meet any of the 3 victory conditions, but if you no longer meet a victory condition during the Assembly phase, the token is returned to the supply. Passing does not exclude you from the rest of the round, but is rather a genuinely strategic arrow in your quiver. Be careful though, wait too long to play a card and you might find that everyone else passes, leaving you with a hand full of wasted opportunities. 17 Action cards may sound somewhat limiting, but it’s the familiarity you’ll quickly engender with these cards that is so important. You know what cards are out there, you know what they do. You know how many cards allow movement or combat, that the opponent to your left is likely desperate for a card that adds a new map tile to the board. These cards are your closest allies, they are the trusted troops you chose to march by your side into battle. But don’t fret, you acolytes of anarchy, you vanguards of volatility, there’s plenty of the unexpected too. One of the action cards is essentially a ‘cancel what my opponent just did’, and one of them allows you to take a card from the discard pile. But moreover, there’s a deck of Epic Tale cards to shake things up. Not only are these unique cards that provide a potentially game breaking action, but unlike the Action cards which are all discarded at the end of the round, Epic Tale cards can be held over. With delightful card art and delightful names such as Brea’s Tyranny and Dagda’s Cauldron, Epic Tales cards can swing games. The pretender’s crown on a purple background. Purple Wedding anyone? And just to add that last dash of variety, each map tile has a corresponding Advantage card. If you are the chieftain of that region at the start of a round, you can add the Advantage card to your hand. There’s definitely a wider range of usefulness here with certain Advantage cards proving far more powerful than others, but simply having that additional action per round can make the ground beneath your feet feel that little bit more secure. For example, the Forest lets you draw a new Epic Tale card after you play one. If you manage to control that card each round, you’ll be in a very powerful position. Combat. It happens, it happens frequently and it’s rarely pleasant for either side. Even as the aggressor, it’s an action fraught with peril regardless of whether you’re assured victory. Unless otherwise stated, if an Action card moves a clan from one territory to another that has any number of opposing clans, combat takes place. All clans present are considered to be engaged, unless the region happens to have a Citadel or two in which case starting to the aggressor’s left, each participating player can move a clan to within the walls of the Citadel and sweet, sweet immunity. Once all Citadel’s are occupied or if there are none, combat begins with the aggressor able to chose a clan to attack, withdraw or play an Epic Tale card. If you are on the receiving end of an attack, you can either remove a clan from the region or discard a card from your hand. Play then moves clockwise to the next player with a clan still participating, who now has a chance to attack back. If all players agree on a truce, combat ends immediately. I like Inis. 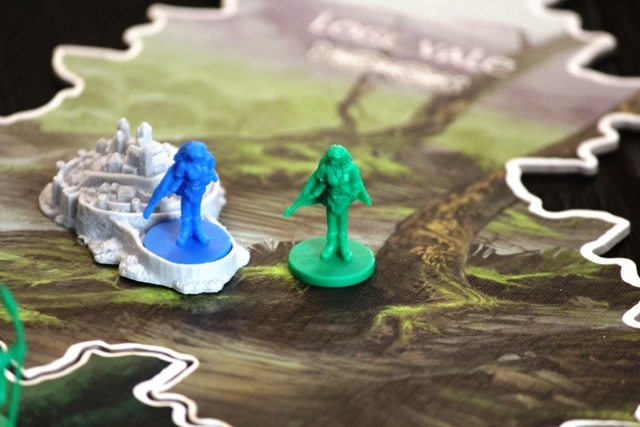 I like Inis a great deal, and for a number of reasons. Let’s start with the combat – sure, even with Blood Rage and Kemet there’s always a risk to attacking another player, but generally speaking if you attack when the odds are in your favour you should prevail without much of a penalty. 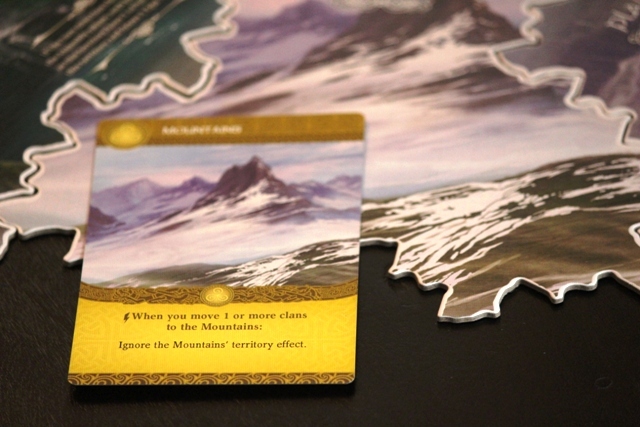 With Inis however, controlling the larger number of clans in a territory is little guarantee of anything – if your opponent isn’t feeling particularly attached to his cards, you could see your presence in that region disappear lickety split. Then of course there’s the fact that one of the victory conditions requires your enemies to be present, which means that often movement and combat are more about simply trying to establish a presence as opposed to wiping your opponents from the board. It feels vastly different to anything else I’ve played – where Scythe boasts a fair bit about the threat of combat being a major gameplay element and doesn’t really measure up, Inis absolutely nails that aspect. If you prefer your combat brutal and bloody, this is far more akin to the art of aggressive negotiation. 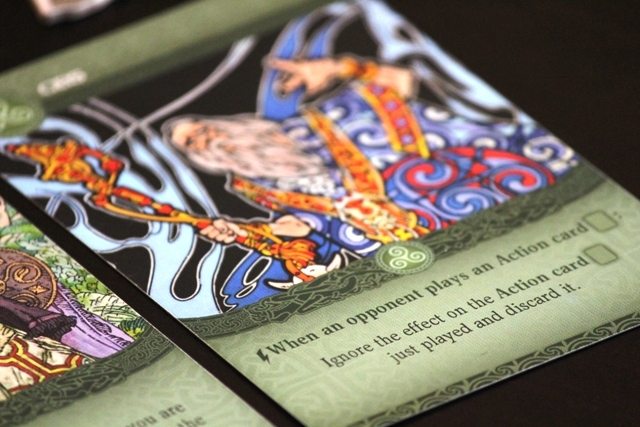 What’s most likely to either swing you for or against Inis is the limited action card pool. If the reason you love Blood Rage or Kemet is based on how the asymmetry of your faction grows over the course of the game, you’ll find none of that here. Knowing those action cards with the intimacy of a prized musical instrument is the key to success. It would follow, you might think, that this approach would equate to a lack of variety or gameplay that lurks in samey territory and that’s fair to a point. 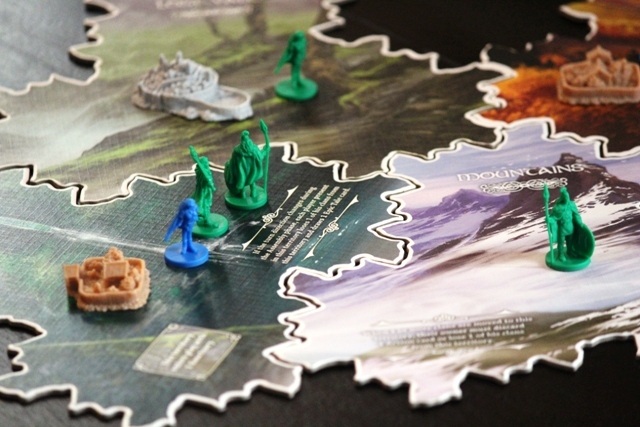 Yes, your fourth or fifth play of Inis won’t feel as different as your fourth play of Cyclades, even with the Epic Tale and Advantage cards that change from game to game. But the joy of the game isn’t predicated on how much stuff there is in the box or playing various factions or builds from game to game. No, Inis is far more akin to chess, reading your opponent, knowing what potential moves he has at his disposal and knowing exactly when to push for a Latvian Gambit. 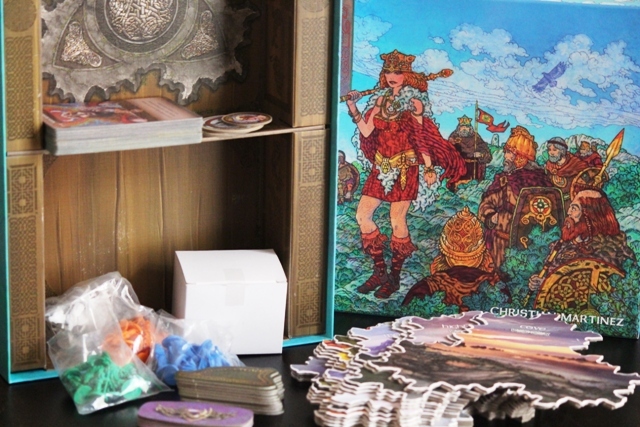 When the underlying design is as tight and well-balanced as Inis is, replayability is as much about mastering strategy as it is about perceived variety. A quick word on the Brenn, which is another element that meshes elegantly – because there’s almost always going to be at least two players poised for victory at any given time, implementing a tie-breaker that actually feels like a natural part of gameplay is super smart. It’s a powerful advantage, but one that impacts on how the Brenn player develops their strategy. This does mean however that Inis does suffer from ‘smash the leader’ syndrome, and in turn as I mentioned earlier, means that a game may reach the point where a player not in a position to win may be able to essentially crown a winner. These elements personally don’t bother me at all, but it may prove a point of contention for you. 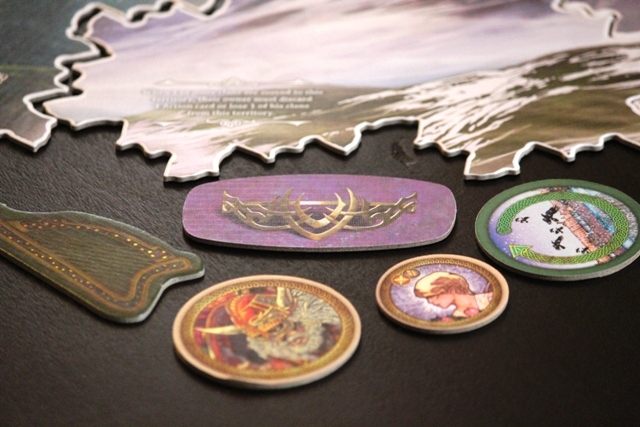 Inis’ final twist in the tale is brought on by the presence of Deed tokens. These are obtained mainly through Epic Tale cards and one or two action cards, but they act as replacements for the values of victory conditions. So if you have two Deed tokens, you only need a presence in four regions, for example. Indicative yet again of how attentive you need to be. There’s no downtime here, every action your opponents take is important and informs the timing of your actions. And it’s pretty great at two players! In less than an hour! The only weakness worth mentioning is that depending on the game state, certain Epic Tale cards can be utterly useless in a given scenario. As they’re not particularly easy to acquire, this can make it feel as if you’ve wasted an action. This is balanced out though by the fact that only you know that it’s useless. I can guarantee that sitting with two or three Epic Tale cards in your hand is often enough to distract or deter an opponent, they are never actually completely without merit. That Inis exists makes me happy. That its theme exists in an ocean of derivative fantasy. That my eyes perform a giddy dance of joy every time I look at it. 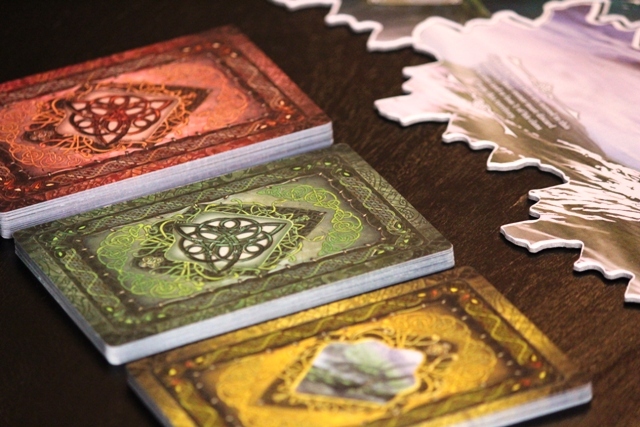 Winning a game of Inis makes you feel like the smartest person at the table, not the strongest. I’m sure it must be fun to wield Mjolnir for an hour or two, but who wants to be Thor when you can be Tony Stark. It's hard not to be drawn in by the seductive whispers of Celtic myth and magic. Hearing names like Dagda and Morrigan and Cathbad conjures images of epic conquests, but Inis' strength ironically is not in a promise of epic action. Rather, like those clans that settled upon Irish shores, your own spiral in the triskele is formed by cunning and subtle manipulation. And though blood will always be shed, staying your hand is powerful indeed.